They are just for GW25 and not cumulative. It only includes selected players who started no subs. The article is in 2 parts. We’ve started with the attacking stats for the players divided by position. 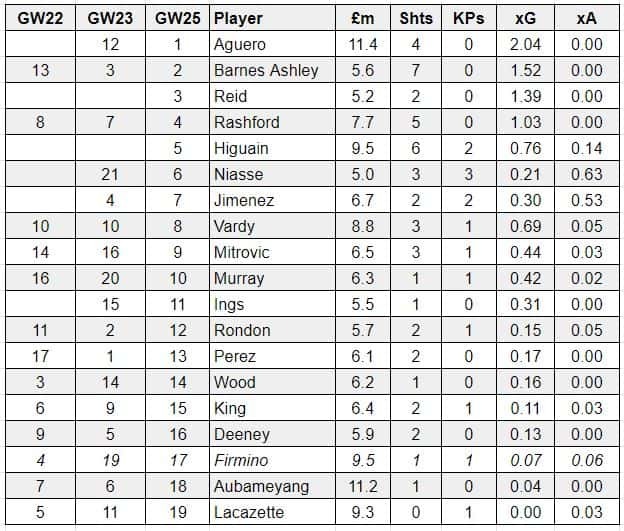 Effectively we’ve taken their xG stats and their xA stats and converted them into FPL points and then ranked them. We don’t show the points but that’s how they’re ranked. It’s far more useful than just ranking them by xG and xA separately. I haven’t attempted to rank every player. There’s shots and key passes so you get a volume perspective as well as a quality perspective. The stats are all from the excellent free site understat.com. Player values are as of Monday 4 February. 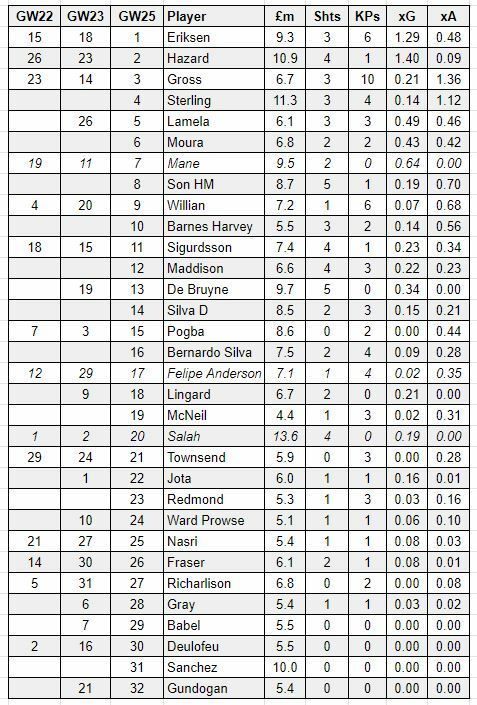 I’ve turned the xG and xA from GW25 only into theoretical FPL points and ranked them. Only attacking points no bonus or appearance points. 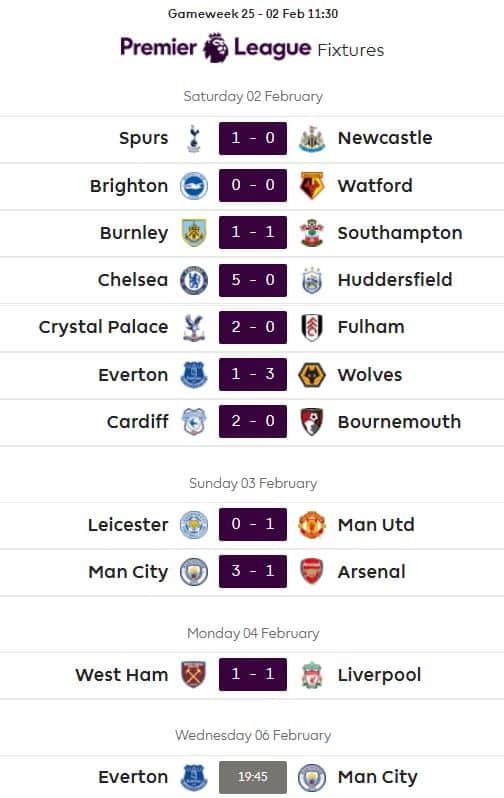 Their ranking for previous gameweeks is also included. If there is a blank it could mean they didn’t play or were a sub or I just didn’t include them for whatever reason. 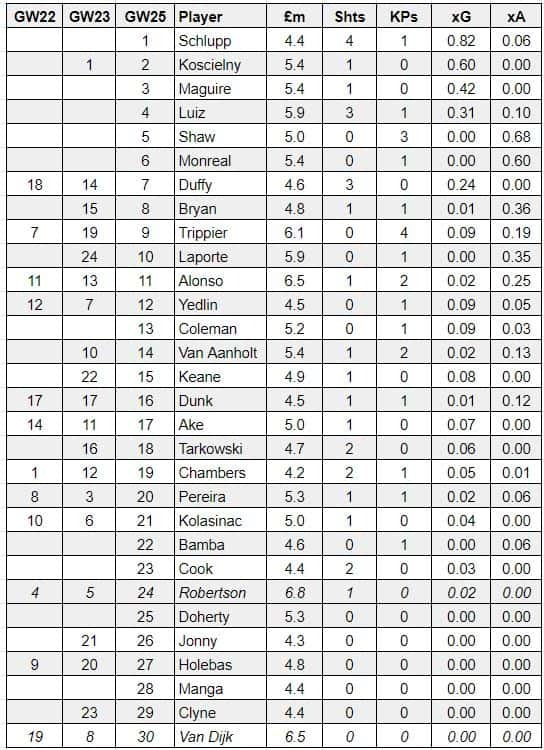 I’ve ranked the team defences by the lowest xG conceded. Mid Son returns to LAM position although moved centrally when Llorente came on as sub. Salah played a right sided forward in a 4-3-3 rather than CF.